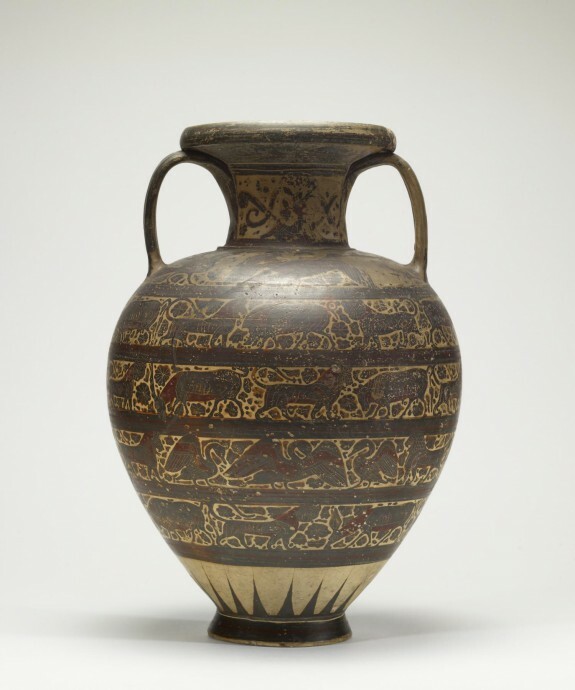 Description With its body divided into five horizontal registers separated by thick black and red lines, this amphora depicts a variety of real and mythical animals on a yellow background crowded with black dots, leaves, and rosettes. The animals–leopards, boars, swans, and goats, as well as mythical harpies, sirens, and sphinxes–are painted with black slip; their details are rendered with a red-purple pigment and incised lines. Although slightly damaged, the palmette design on one side of the neck is still visible. Corinth dominated the Mediterranean pottery industry from the second half of the seventh century BCE through the first half of the sixth century BCE. Corinthian ceramics were typically light yellow or white clay decorated with black, white, and red glazes. This style of pottery often uses Near Eastern, or “Orientalizing,” motifs, depicting real and mythological animals in registers crowded with incised rosettes. While dot rosettes are typical of Proto-Corinthian ware, “ripe” Corinthian vessels of the late seventh and early six century BCE are characterized by their incised rosettes, using line to indicate the individual petals. In Search of Ancient Treasure: 40 Years of Collecting. The Walters Art Gallery, Baltimore. 1978. Provenance Henry G. Marquand, New York [date and mode of acquisition unknown]; Henry G. Marquand Sale, American Art Galleries, New York, 1902, no. 972. Robert Garrett, Baltimore, by purchase [date of acquisition unknown]; Kende Galleries, New York, The Robert Garrett Collection Sale, October 6, 1951, no. 96; Walters Art Museum, 1951, by purchase.